$14.29 on Amazon look inside this book! Op art remains popular for its absorbing and provocative sensory impressions. When the visual provocation is subtle, the viewer looks more closely to make sense of it. 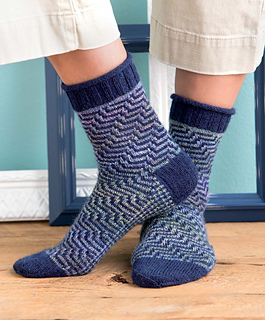 In the socks shown here, narrow stripes of a variegated yarn are traversed by stripes in a darker color. This project is simple and can be easily worked by beginners. 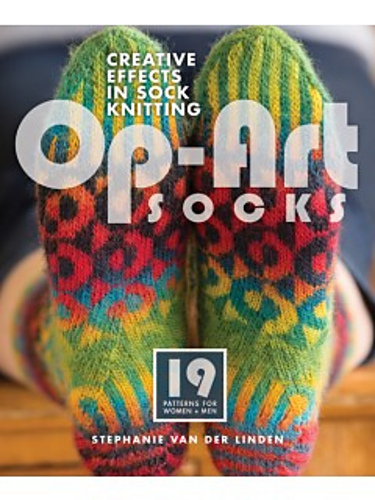 For added visual play, the right and left socks are mirror images. Sizes: About 7½ (8)“ (19 20.5 cm) foot circumference, unstretched, and 9¾ (10½)” (25 26.5 cm) foot length from back of heel to tip of toe (length is adjustable). To fit U.S. women’s shoe sizes 7½–8½ (men’s 9–10; European shoe sizes 39– 40 (42–44).